You hang out for the entire morning in first-floor workshop located in Brugg in the canton of Aargau, Switzerland, and you won’t see a Hermes watch, for the workshop has been only used to produce leather watchbands for Hermes since 2006. Each step of manufacturing process happens here, including cutting, temperature control, sewing, decoration and logo or serial number stamping. Alligator skin, crocodile skin, lamb skin, ostrich skin, Barenia natural calf skin and other animal skins are used to make leather watchbands for Hermes. More than 50-model watchbands in more than 2000 colors are available. The range of dimension includes approx 300. So, Hermes watches has multiform collocations, and the number added up is amazing and surprising. 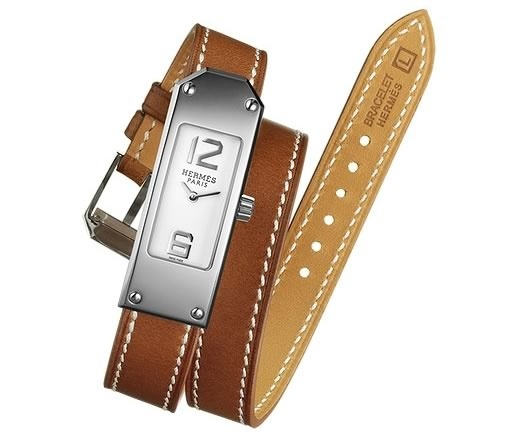 What makes Hermes leather watchband so distinctive? A simple answer. It’s enthusiasm and devotion every craftsman throws into. The spirit can not only meet harsh standards but also keep the ways to produce and finish go on forever. That all manufacturing steps are done in Hermes own workshop brings an advantage for Hermes making sure high quality of leather watch straps. Every step shows superb aesthetics. First, Pre-cutting! Craftsmen select and match two pieces of a couple of watch strap, and they must guarantee winkles, scratches and veins don’t appear on the animal skins. They will be abandoned as long as the animal skins have any flaw. Hermes can’t sell animal skins with flaws or leftover bits and pieces to some buyers, since it must build its status in the leather market. They will be used as heating materials for heating suppliers. Second, Sewing! The following work is done by hand, very hard. The lining materials are inserted in two pieces of leather first. Then, punching and sewing by hand begins. Craftsmen use linen thread to go two-way sewing, and the handmade sewing style is more durable than machine operation. Next, both sides of a leather band will be colored with house-made liquid after they are softened and polished. To meet the standards of high quality, the two steps usually are repeated time after time. Meanwhile, the edges are hot-pressed and sealed. Then, with waxing and polishing, and use paraffin wax to seal the edge part. Next, the bottom of a watchband is affixed with H-shaped sewing. Third, Testing! Craftsmen will submit them to the quality control center after they are satisfied with their works. The year of manufacturing and serial number will be printed in the bottom of the watchband after passing tests. Only enthusiasm, devotion and careful, serious attitude make Hermes leather watch straps so distinctive. The principle applies to any job, absolutely.